"YES, AMAZING SECRETS OF THE OLD WORLD ARE NOW HERE FOR YOU." ► Unmatched Quality: Handcrafted - not some cheap foreign import that will arrive broken, scratched, marred or smelling of chemicals. ► Original Work of Art - No two are the same: If you put 100 or 1,000 of the same design next to each other, each one would be different from all of the others. This is because each wood shown has its own unique wood grain pattern and color. - Outside wood has a satin lacquer finish, the bottom has tan velvet to prevent scratches. - Inside walls are lacquer finished, inside bottom is black velvet to protect your fine jewelry. - We use environmentally friendly Rubberwood [mature plantation trees that are no longer able to produce latex]. MarqART is Amazing!.....I am Proud to give as a gift.....Best Quality out there.....Friendly Customer Service.....I will Buy Another one. 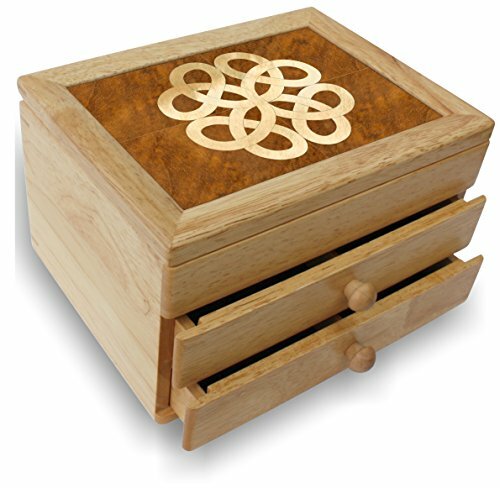 Color: Celtic Jewelry Box (#6852 Size: 6"x8"x5"). . . . an Original Work of Art - No Two Are the Same - Each is Unique . . . . a Label Comes Inside Each Jewelry Box That Explains the Wood Species That Were Used in Its Creation . . . . This Design Shows 38 Individual Pieces and 3 Unique Wood Species . . . . Each Wood Shown Has Its Own Unique Wood Grain Pattern and Color. If you have any questions about this product by MarqART, contact us by completing and submitting the form below. If you are looking for a specif part number, please include it with your message.